We’d love your help. Let us know what’s wrong with this preview of The Great Convergence by Richard Baldwin. Between 1820 and 1990, the share of world income going to today's wealthy nations soared from twenty percent to almost seventy. Since then, that share has plummeted to where it was in 1900. As Richard Baldwin explains, this reversal of fortune reflects a new age of globalisation that is drastically different from the old. In the 1800s, globalisation leaped forward when stea Between 1820 and 1990, the share of world income going to today's wealthy nations soared from twenty percent to almost seventy. Since then, that share has plummeted to where it was in 1900. As Richard Baldwin explains, this reversal of fortune reflects a new age of globalisation that is drastically different from the old. In the 1800s, globalisation leaped forward when steam power and international peace lowered the costs of moving goods across borders. This triggered a self-fueling cycle of industrial agglomeration and growth that propelled today's rich nations to dominance. That was the Great Divergence. The new globalisation is driven by information technology, which has radically reduced the cost of moving ideas across borders. This has made it practical for multinational firms to move labor-intensive work to developing nations. But to keep the whole manufacturing process in sync, the firms also shipped their marketing, managerial, and technical know-how abroad along with the offshored jobs. The new possibility of combining high tech with low wages propelled the rapid industrialisation of a handful of developing nations, the simultaneous deindustrialisation of developed nations, and a commodity supercycle that is only now petering out. The result is today's Great Convergence. To ask other readers questions about The Great Convergence, please sign up. Study of globalization w/r/t the costs of trade and how it becomes 'unbundled'. The first great stage of globalization was in the transportation of goods across longer distances and shorter periods of time, starting from the domestication of pack animals to the invention of steamboat. Moving goods became much cheaper, but communicating ideas was much more expensive until the 1990s - moving documents or files was a cumbersome process before the internet. Between 1820 and 1990, industries had an i Study of globalization w/r/t the costs of trade and how it becomes 'unbundled'. The first great stage of globalization was in the transportation of goods across longer distances and shorter periods of time, starting from the domestication of pack animals to the invention of steamboat. Moving goods became much cheaper, but communicating ideas was much more expensive until the 1990s - moving documents or files was a cumbersome process before the internet. Between 1820 and 1990, industries had an incentive to cluster within nations, and the greatest beneficiaries were the United States, Canada, Japan, and a small cluster in Western Europe. Nations - industries and workers - competed against each other. But since the 1990s, as communication became much cheaper and faster, a new sort of unbundling occurred. Production chains became scattered across different nations, where products can be 'made' across different stages involving multiple countries at once. A product can be designed in one country, assembled in another, using raw materials mined in a third. Before, developing countries had to come up with the technical expertise to develop production chains almost from scratch - now they benefit from it wholesale, provided they're willing to accept foreign investment and thus foreign involvement in the domestic economy. Companies have outsourced their production with stunning speed, leaving the low-skilled manufacturing workers unable to compete with lower wages elsewhere, combined with their companies' technical expertise. In this regard, Baldwin sees tariffs as a 19th century solution to a 21st century problem. A tariff in the current circumstances is just building a wall in the middle of a factory, and companies can and will move elsewhere as the costs of production increase. He sees the world self-segregating into a world where skill-intensive industries gather in countries with well-educated and well-trained populations, and labor-intensive occupations go where the wages are low. This could be further exacerbated with (hypothetical) communications technology, like a more advanced Skype or advanced robotic control from a distance, where individuals could compete on a global market. Excellent book for anyone interested in a scientific yet accessible analysis of the current economic globalisation process. An instant classic for the next few years, I would say. The concluding remark summarizes the content of the book perfectly: "Things have changed so much that not even the future is what it used to be." The book brings the story on why todays globalisation differs from our parents' globalization. Lowering trade costs caused a first worldwide unbundling, which triggered a drop in the transfer of ideas and knowledge through ICT as basis for a second unbundlin. In the future, the virtual presence revolution (being the drop of costs for physical presence) The concluding remark summarizes the content of the book perfectly: "Things have changed so much that not even the future is what it used to be." The book brings the story on why todays globalisation differs from our parents' globalization. Lowering trade costs caused a first worldwide unbundling, which triggered a drop in the transfer of ideas and knowledge through ICT as basis for a second unbundlin. In the future, the virtual presence revolution (being the drop of costs for physical presence) will cause a further natural evolution of the manufacturing market, but cause a true revolution in the service sector. When people get pissed on they grow tired of being told its raining. That seems to be the message of globalization books. Generally to justify the prevailing arrangements and keep them going in the same direction by appealing to some iron law of economics or the dynamics of globalization. These arrangements are imposed by potentates and only stay in place because people more often than not acquiesce. Este libro de Richard Baldwin bien podría ser la mejor lectura para entender la globalización durante los últimos dos siglos. La premisa del libro es que la globalización puede entenderse como un proceso de tres pasos. El primero al relajar los costos de transporte de mercancias facilito el comercio entre los países. El resultado de este proceso es la gran divergencia entre las economías avanzadas y las economías en desarrollo.El segundo paso ocurre al relajar el costo de mover ideas entre disti Este libro de Richard Baldwin bien podría ser la mejor lectura para entender la globalización durante los últimos dos siglos. La premisa del libro es que la globalización puede entenderse como un proceso de tres pasos. El primero al relajar los costos de transporte de mercancias facilito el comercio entre los países. El resultado de este proceso es la gran divergencia entre las economías avanzadas y las economías en desarrollo.El segundo paso ocurre al relajar el costo de mover ideas entre distintos países facilito que surgieran las cadenas globales de valor y de esta forma se combinara la tecnología avanzada de los países desarrollados con los bajos salarios de los países en desarrollo. El resultado de esta combinación es la gran convergencia. Baldwin explica de forma clara y amigable todos las implicaciones que los cambios en la globalización han traido y hace algunas conjeturas sobre que podría ocurrir en un tercer paso, cuando los costos de mover personas entre países bajen por una mezcla de avances tecnologicos en las tecnologías de la información y la transformación de la manufactura por el advenimiento de la inteligencia artificial. Richard Baldwin provides a framework for understanding globalization as an "unbundling" between consumption and production, and how technological innovations lifted three important constraints: the cost of moving goods, the cost of moving ideas, and the cost of moving people. The first wave of globalization was sparked by innovations made during the Industrial Revolution and led to decreased costs in moving goods, leading to industrialization in the North and deindustrialization in the South. The Richard Baldwin provides a framework for understanding globalization as an "unbundling" between consumption and production, and how technological innovations lifted three important constraints: the cost of moving goods, the cost of moving ideas, and the cost of moving people. The first wave of globalization was sparked by innovations made during the Industrial Revolution and led to decreased costs in moving goods, leading to industrialization in the North and deindustrialization in the South. The so-called "Great Divergence" occurred because the high costs of moving ideas trapped industrial innovations in the North. The second wave of globalization occurred in the 80s and 90s as improvements in ICT allowed for more knowledge transfers from the North to the South. As such, countries like China and India were able to plug into global supply chains. Their share of manufacturing increased, while those of the G7, the early beneficiaries of globalization, decreased. However, clustering still occurred because trade bumped up against the third constraint: the high cost of moving people. Baldwin projects that advances in telerobotics and telepresence will spark the third wave of globalization leading to new winners and losers. This book mostly claims to be a book about “globalization,” today’s trendy word, but really, it is a book about industrial revolutions through time and space. The author, Richard Baldwin, offers a new framework for understanding how the world has developed since the Great Divergence, led by England, that created centuries-long worldwide economic dominance by European cultures. In particular, he offers an explanation why, since 1990, the relative share of the global economic pie held by the West This book mostly claims to be a book about “globalization,” today’s trendy word, but really, it is a book about industrial revolutions through time and space. The author, Richard Baldwin, offers a new framework for understanding how the world has developed since the Great Divergence, led by England, that created centuries-long worldwide economic dominance by European cultures. In particular, he offers an explanation why, since 1990, the relative share of the global economic pie held by the West has decreased, when it had never decreased before. All this is interesting and valuable, in particular Baldwin’s conclusion that American critics of globalization are at least partially correct. But it’s incomplete in the end, since Baldwin’s analysis completely omits the critical role of culture and institutions as related to a country’s capacity to develop. Instead, he treats all humans as interchangeable members of homo economicus: a fatal error, but one common to academic economists. But whether it was necessary or not, such actions imply an ever-increasing stratification. Why did a majority of English voters choose Brexit? In part, because they are tired of the “professional and managerial elite,” in the words of Joan Williams, that is, the types of people newly hired by Dyson, getting richer while they get poorer due to the New Globalization. (On the other hand, Sir James supported Brexit, so maybe there is more to the story.) Baldwin concludes that no matter what, “there will be factory jobs in G7 nations for high-skill workers and robots. Low- and medium-skill workers will see their jobs eliminated or offshored.” Baldwin’s “rethinking” is less fresh thought and more a placid acceptance of serfdom for most American workers, which is not likely to be a palatable political option. The probable result is more Trump and more Brexits, whether or not that makes economic sense. After all, there are many obvious ways a government could reverse the course of the New Globalization—among them, forbidding the export of know-how, or taxing profits upon their return. Baldwin ignores these solutions, though, presumably because he believes they would be Neanderthal and economically inefficient—he says we must not “resist the changes,” though he never says why we must not. Baldwin has here written a solid up to date book, as of 2018, on globalization. Although he seems to have tried hard to avoid it, Baldwin falls into the trap of spending too long on the past. Still that's an all too common error for such books and other authors have done much worse in that regard. Spending the 5-6 hours it takes you to read this book brings you reasonably up to date on the academic view of globalization. Assuming that's what you want and you can stand basic history on the subject Baldwin has here written a solid up to date book, as of 2018, on globalization. Although he seems to have tried hard to avoid it, Baldwin falls into the trap of spending too long on the past. Still that's an all too common error for such books and other authors have done much worse in that regard. The harnessing of steam power in the 18th century made it possible for resources and materials and finished products to be transported at a small fraction of the previous cost. Therefore, in the 19th century manufacturing enterprises began locating in areas where there was the technical knowledge necessary to accomplish such manufacturing activities. Because they were able to buy raw materials low and sell finished products high, these areas became much wealthier. This was known as The Great Div The harnessing of steam power in the 18th century made it possible for resources and materials and finished products to be transported at a small fraction of the previous cost. Therefore, in the 19th century manufacturing enterprises began locating in areas where there was the technical knowledge necessary to accomplish such manufacturing activities. Because they were able to buy raw materials low and sell finished products high, these areas became much wealthier. This was known as The Great Divergence. With the invention of the internet, the cost of moving technical knowledge became essentially zero. This took away much of the advantage of the areas with greater technical knowledge and allowed those areas that had been left behind by the The Great Divergence to leverage their lower wage costs to become the favored areas for manufacturing. As a result, their wealth, relative to previously industrialized, began to increase. Therefore, we are now witnessing The Great Convergence. This is a very solid book by a careful, competent and knowledgeable economist. I'm not going to attempt a thorough going review, at least for now. From the vantage point of Spring 2018 with President Trump's attacks on global trade in full blossom, it's hard to be as optimistic as the author abour the low chances of a retreat to the dark ages of protectionism. But perhaps it will turn out to have been mostly posturing? The second point is a question that rose in my mind about the This is a very solid book by a careful, competent and knowledgeable economist. The second point is a question that rose in my mind about the role of firms and the genesis of future firms. In the latest unbundling of locational advantages, firms can combine their know-how with low cost labour, controlling the process through the capacities offered by ICT, capacities that will continue to strengthen. Comparative advantage, the driver of trade and the source of the benefits, belongs to the firm, rather than to the Portugals and Englands (as per Ricardo's original example), i.e. to the nation. But in the future unfolding of globalization (assuming no dark ages) what scope will there be for new firms with new products, ideas, technologies to emerge? And coulld they emerge anywhere in the connected world? Or do the old industrial economies (and maybe China) have an insurmountable advantage? Books come in all varieties and this one sits in my 'fundamental academic' category. Richard Baldwin tries to make us better understand how gloabilsation came about, how it evolved the way it did, based on some fundamental drivers in our societies. In doing so, he tries to tell us something about the current wave of globalisation that is hitting our economies right now. Probably my choice of wording already indicates that many of us feel like we are on the receiving end of the punches. My person Books come in all varieties and this one sits in my 'fundamental academic' category. Richard Baldwin tries to make us better understand how gloabilsation came about, how it evolved the way it did, based on some fundamental drivers in our societies. In doing so, he tries to tell us something about the current wave of globalisation that is hitting our economies right now. Probably my choice of wording already indicates that many of us feel like we are on the receiving end of the punches. My personal drive to read the book was more on a positive note: let's try to understand better the world we live in, so we are better equiped to ride the waves. And the world and economy has changed a lot since the nineties when I took up my first job. A lot of this change is welcomed, positive and we can't wait to get our hands on it, but a lot (all) carries consequences we don't always aknowledge immediately. The most significant and important social science/economics monograph I've read in the past decade, with the exception of the Picketty book. Globalization 2.0 is not what we think it is, and we're not even using the right words when we talk about it. Socially and politically we'll never cope with the nature of the global economy if we don't understand what's really happening. This book does a better job of illuminating how economies have changed since the 1990s than anything else I've read. More The most significant and important social science/economics monograph I've read in the past decade, with the exception of the Picketty book. Globalization 2.0 is not what we think it is, and we're not even using the right words when we talk about it. Socially and politically we'll never cope with the nature of the global economy if we don't understand what's really happening. This book does a better job of illuminating how economies have changed since the 1990s than anything else I've read. More importantly, it changes the entire conversation, for the better, by explaining how and why the old vocabulary and the old debate don't make any sense anymore. Data driven look on the history of globalization. A framework of how to think about globalization is also presented. Globalization is seen as a process of separating(geographically at first) the production and consumption of goods. The Industrial and the IT revolution are refracted through this mindset. I loved the whole structure of interpreting data -> building a hypothesis/theory -> looking at the history through the lens of the new hypothesis/theory. 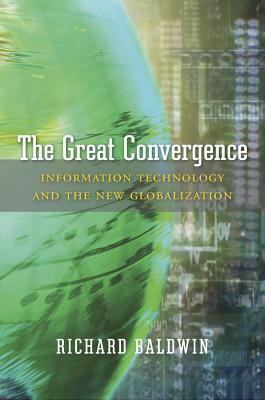 The opening line of this book sets out its ambition: "This book aims to change the way you think about globalization." And I would say it largely succeeds through a combination of economic history, trade theory, well deployed descriptive statistics, observation, and--in the conclusion--a certain amount of imagination. Excellent overview of globalisation of the last 1000 years. Specific analysis on how production and parts of production have changed and gone off-shore. Interesting future conjectures on impacts for future of robots and high speed communications and introduction to labour force of people from developing nations via this technology. very poorly written book. It's very typical of authors busy with academia to just put together all their papers in a confused manner and put them into a book. The chapters are highly redundant, the main message was clear from the introduction. Anyone who has the ambition to participate in an intelligent discussion of how globalisation has unfolded over the last two decades and what it implies for both developed and developing countries, should read this book. Interesting look at history and predictions for the future. Progress enabled by the swift movement of goods around the world followed by ideas. Are people next--i.e. can someone in China cut my hair using telepresence and robotics? Can't wait to find out. Regardless of the insufficient consideration of cultural aspects and the advances of artificial intelligence (it does consider automation and remote intelligence) , this book was very insightful about globalization's history and economics. This book is sort of a "Guns, Germs, and Steel" of globalization - a bit repetitive, and very nerdy. (It was a text for our doctoral program.) But approachable for non-academics and worth understanding, conceptually. Great insights into the various stages of globalisation from the distant past to the near future. I need to integrate this into my thinking. The people who need to read this book probably wont. These people are Donald Trump, Bernie Sanders and Jeremy Corbyn along with their respective supporters. The time when the West dominated the global economy is over thanks to the information, communication and transport revolution. The world has changed and will continue to change and we had better get used to it. Despite it doesn't go into the cons of globalization, at least I started to re-look into the pros of technology, which is often viewed as black and white- one extreme or the other: either creating and using it at the expense of people and the environment or thinking that technology itself is the culprit. Besides the fact that there are sustainable technologies that do not have to harm the ecology and people around it, it made me think how technology can be used as alternatives to some harmful in Despite it doesn't go into the cons of globalization, at least I started to re-look into the pros of technology, which is often viewed as black and white- one extreme or the other: either creating and using it at the expense of people and the environment or thinking that technology itself is the culprit. Besides the fact that there are sustainable technologies that do not have to harm the ecology and people around it, it made me think how technology can be used as alternatives to some harmful institutions, such as the prison industrial complex or modern-day slavery, especially when re-looking and being reminded how the cotton gin played a role in abolishing past slavery in North America. The book was recommended by "The Economist", the author analyzed deeply the globalization from past to present and with great insights on how it will be the trend for future. He explains the big disruption starting from 1820 when G7 countries have only less than 20% of world GDP to reach nearly 80% in 1990, the author name this phase "the great divergence" and how China and India start taking back their part in global GDP since last 2 decades by recovering their historical part of world economy The book was recommended by "The Economist", the author analyzed deeply the globalization from past to present and with great insights on how it will be the trend for future. He explains the big disruption starting from 1820 when G7 countries have only less than 20% of world GDP to reach nearly 80% in 1990, the author name this phase "the great divergence" and how China and India start taking back their part in global GDP since last 2 decades by recovering their historical part of world economy which was always around 50%.